The Sacred Harp Musical Heritage Association will hold Camp Fasola for learning Sacred Harp singing, history, and traditions for the ninth consecutive year. This year, there will be three sessions of Camp Fasola. In addition to our adult emphasis camp and a youth emphasis camp, both held in Alabama, we are offering a session held in Europe. Camp Fasola – Youth Emphasis is open to both youth and adults, beginners and experienced singers, though a large majority of its camper slots reserved for youth. Adults who desire to accompany their youth may attend. Multiple daily sessions will be devoted to teaching Sacred Harp singing, as well as times for recreation, rest, fellowship, and singing. All campers will be expected to perform some area of service during the week. 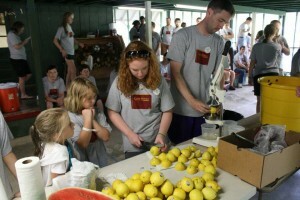 More than 200 campers attended in 2010. Sleeping at Camp Lee are lodge style with bunk beds (linens not provided) and community bathrooms (separate lodges for males and females). The Youth Emphasis Camp will begin on Monday, July 2nd at 4:00 p.m. and will run through Friday, July 6th at 9:00 a.m. This session will be programmed with an emphasis for youth and adults under age 30 (full recreation schedule, fewer singing elective classes). Session 2 will be held at Camp Lee near Anniston, Alabama. While the two camp sessions are not exclusive for different age groups, the sessions are structured to offer classes and activities that better fit the interests shown by youth and adults in past camps. Session 2 will have a large majority of its camper slots reserved for youth. Adults who desire to accompany their youth may attend Session 2. Also, some campers may need to attend a particular session to fit their personal schedules.